She recalled that at the age of 15, “because of my love for ocean swimming – ocean races more than pool races – my mother bought a little house down in Costa Mesa, near Newport Beach and Corona Del Mar. That was 1934.” That same year, Mary Ann competed with the Ambassador Hotel Swim Team in an 880-yard paddleboard race and won-against men. Mary Ann’s stay at Costa Mesa and as a regular at Corona del Mar was brief, as she and her mother moved to Santa Monica in 1935. Now solidly in surf mode, she got her own board, which was almost unheard of in California in the mid-’30s. Although girls were part of the beach scene, few took to riding other than tandem. Also, the weight of surfboards was considerable. They were so heavy that they had to be literally dragged up and down the trail at places like Palos Verdes Cove. At the time, Mary Ann probably weighed less than her surfboard. “I wasn’t very good,” she said modestly, “and I was always the only girl out there surfing.” At Santa Monica, she fell in with a group of guys that included Tulie Clark, Hoppy Swarts, Bud Morrisey, Barney Wilkes and E.J. Oshier and her surfing improved. Mary Ann tried out for the Olympics in 1936, at the age of 17, but didn’t make it in for reasons unknown. Despite this, she never expressed any disappointment that she did not follow in Duke’s wake in competitive swimming. It was a big jump to make for an eighteen year-old woman, but she took the steamship ride to the Hawaiian Islands and competed in the Pacific Aquatic Festival. She won the women’s half-mile and the 880-yard and broke a record in the 220-yard. More importantly for her, however, was the chance to surf Queens and meet Duke Kahanamoku, who had inspired her as a young girl. “My very favorite surf spot in all this world is Canoe Surf in Waikiki,” Mary Ann declared many years later. “In 1939, when I was over there, Duke helped me in every way. He’d always have me get to his right, he’d coach me… Duke and his brother and I were a team together. He picked me to team with him, to surf against the Australians.” That surfing competition was cancelled, but Mary Ann came home from Hawaii with her most cherished memento: a photo of her shaking hands with Duke. From 1938 to 1940, Mary Ann reigned as the women’s division champion of the Pacific Coast Surfboard Championships, and was also the paddleboard champion. In the late 1930s, aquaplaning was also a popular sport in southern California. The Catalina Aquaplane Race was a 44-mile pull from Avalon, on Catalina Island, to Hermosa Beach, and Mary Ann won that, as well. 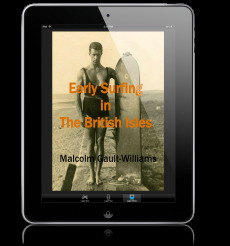 A teenage swimming, paddling and surfing champion in the 1930s, Mary Ann drew lots of attention going on into her 20s. She was featured surfing in a 1938 issue of Life magazine. Shortly afterward and after appearing in newspapers and magazines for her various triumphs and feats, as well as being the poster girl for Palos Verdes, Mary Ann began to attract the attention of Hollywood. She was asked to double for Judy Garland, but was told she was too athletic to fool the camera – Garland was less than five feet tall. After trimming down, Mary Ann’s first role was an extra in the pool doing water ballet for Washington Melodrama in 1941. Mary Ann doubled for Dorothy Lamour in Aloma of the South Seas (1941) and Beyond the Blue Horizon (1942), and then worked with Johnny Weissmuller in Jungle Jim (1948) and most of the of the 12 Tarzan pictures that ran from 1932 to 1948. She performed many stunts, including swinging from vines, swimming across burning rivers and putting her head in the mouth of a tiger. Mary Ann Hawkins “was the marrying kind,” tying the knot four times. She went from being a Hawkins to a Morrissey to a McGuire to a Sears to a Midkiff. The fact that she had four husbands embarrassed her a bit and, unfortunately, helps obscure her total record of accomplishments. Her first marriage was to surfer/shaper Bud Morrissey and they had a daughter, Kathy. The first marriage ended in the late 1940s and in 1950 she married another waterman named Don McGuire. That marriage produced a son, Rusty, but ended in tragedy when McGuire drowned while boating to Catalina Island with a Hollywood stuntman named Paul Stader. The boat foundered about 10 miles off Catalina. Stader made it to safety, but McGuire did not, leaving Mary Ann with two children. In 1954, Life Magazine did a feature on the movie Oklahoma which showed Shirley Jones jumping 15 feet from a burning haystack. Mary Ann McGuire broke her ankle doing that stunt – her only serious injury as a stuntwoman. In 1955 Mary Ann married Fred Sears, a movie director with a long, decent string of credits including Earth vs. The Flying Saucers and the first full-length rock and roll picture Rock Around the Clock. That same year, while working on The Prodigal, Mary Ann Sears wore a costume made of 10 pounds of pearls and performed a fall from a 24-foot platform into a nine-foot diameter, six-foot deep pool on fire. According to Mary Ann’s personal resume, in 1956 she doubled for Carole Baker and Elizabeth Taylor in Giant, and also had an acting role. Her marriage with Fred Sears was short. A year after the marriage ceremony, Mary Ann was once again a single mother of two: Rusty McGuire and Kathy Morrissey. She moved the family to Hawai’i in 1956 to work on another movie. She surfed Canoes as much as possible and was hired to do a water show at the Hilton Hawaiian Village during a time when air travel was opening the Hawaiian Islands up as a world-renowned vacation spot. Mary Ann’s water shows featured special appearances by her friend Esther Williams, beachboy Sam Kahanamoku and Duke Kahanamoku. Ricky Grigg’s sister Robin provided more detail about Mary Ann’s water shows and her use of the pool to teach swimming. Robin Grigg was one of the most accomplished water women of the 1950s. 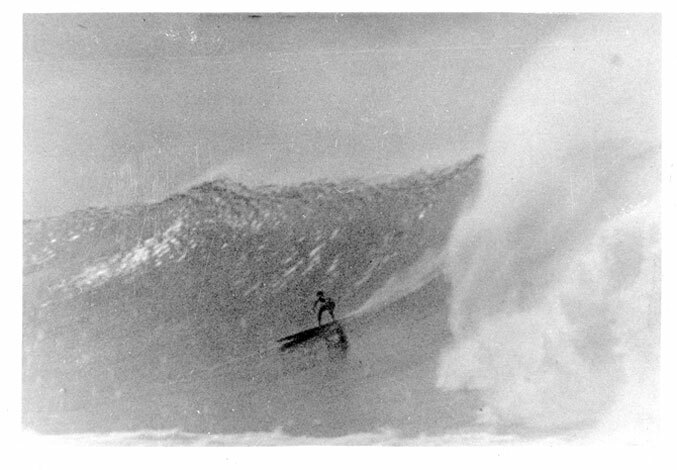 In 1959, she moved to O’ahu “with a degree in Physical Therapy from Stanford in one hand and a Dave Sweet surfboard in the other.” Robin finished third in the Makaha Invitational that year and lived with Mary Ann for awhile. She has lived in Hawai’i from then on. “When Mary Ann got to Hawaii, she befriended Henry Kaiser who owned what would become the Hilton Hawaiian Village,” Robin recalled. She not only did well for herself, but also did well for thousands of novice swimmers aged six weeks to three years old. For thirty years, from 1956 to 1986, the Mary Ann Sears Swim School in Waikiki instructed thousands of babies to hold their breath while swimming under water and breathe on the surface. Comfort in the water came naturally to Mary Ann but she believed this affinity was natural to all humans, and she proved it by taking children as young as six weeks old from the bottom of the pool to the top, and teaching them what they instinctively already knew how to do. Mary Ann’s teaching babies to swim was once quite controversial. The National YWCA, the American Medical Association and the American Academy of Pediatrics all thought her practices with babies less than three years old would lead to ear infections, water intoxication and other viral infections. Their fears were never born out by the reality. On ABC-TV’s You Asked For It, Mary Ann held her breath for two minutes and fifteen seconds, setting a world record at that point. In 1985, Jack and Mary Ann Midkiff moved to Tucson, Arizona. Retired there, she played golf, took it easy and “probably spent more than a little time in the pool.” She passed away, from cancer, at the age of 73, in 1993. Her memorial, held at the Outrigger Canoe Club, was attended by hundreds and she was eulogized by every newspaper columnist in the Islands. Warshaw, ©2003, p. 257. Quoting Jeff Duclos from an article written in 1999. Notes from Ben Marcus, March 2008, with special thanks to Gary Lynch, Robin Grigg, Malcolm Gault-Williams, Dr. Norman Ball and Kathy Merrill Kelley. Mary Ann quoted. Notes from Ben Marcus, March 2008. Mary Ann quoted. Notes from Ben Marcus, March 2008. See also chapter on Whitey Harrison, “San Onofre.” Mary Ann’s recollections would put the first organized assault on San O as being in 1934. Notes from Ben Marcus, March 2008. Warshaw, Matt. The Encyclopedia of Surfing, ©2003, pp. 257-258. Warshaw calls it the “Duke Kahanamoku Swim Meet” and Marcus calls it the “Pacific Aquatic Festival.” Not sure of which one is the right title, unless they were separate competitions. See chapter on Doc Ball. Gault-Williams, Malcolm. “Tommy Zahn: For the Pure Joy of It All,” ©2002. Notes from Ben Marcus, March 2008. Robin Grigg quoted. Honolulu Star-Advertiser, April 22, 1979. Warshaw, Matt. Encyclopedia of Surfing, ©2003, p. 258. See also Marcus, March 2008.